The NASA earth data fire map accumulates the locations of fires detected by moderate-resolution imaging spectroradiometer (MODIS) on board the Terra and Aqua satellites over a 10-day period. 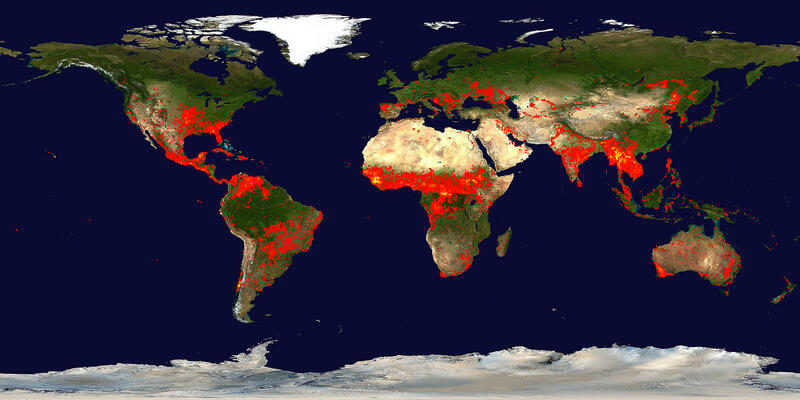 Each colored dot indicates a location where MODIS detected at least one fire during the compositing period. Color ranges from red where the fire count is low to yellow where number of fires is large. The About Rapid Response Imagery page provides more information on usage guidelines, product quality, and algorithms for the fire location data.